What do I do with a tick bite? Ticks are small, blood-sucking bugs. They can range in size from as small as a pin’s head to as large as a pencil eraser. They are an arachnid, which means they are related to spiders. The different kinds of ticks can range in color from shades of brown to reddish brown and black. As they take in more blood they become engorged, meaning ticks grow. At their largest, ticks can be about the size of a marble. Ticks prefer warm, moist areas of the body. Once a tick gets on your body, they are likely to walk to your armpits, groin, or scalp. When they are in a desirable spot, they bite into your skin and begin drawing blood. Unlike most other bugs that bite, ticks typically remain attached to your body after they bite you. After engorged, the tick will detach itself and fall off, then go off and reproduce. Lyme disease is one of many disease that can be caused by infection from the bite of a tick. It is caused by the bacterium Borrelia burgdorferi and is transmitted to humans through the bite of infected deer ticks (which are small ticks about the size of a sesame seed). Other types of ticks do not carry Lyme disease, though they may carry other infectious diseases. In order for the deer tick to transmit Lyme disease to a person it must itself be infected and it must be attached to the person for at least 36 hours. Typical symptoms of Lyme disease include fever, headache, fatigue, and a characteristic skin rash called erythema migrans (see picture). 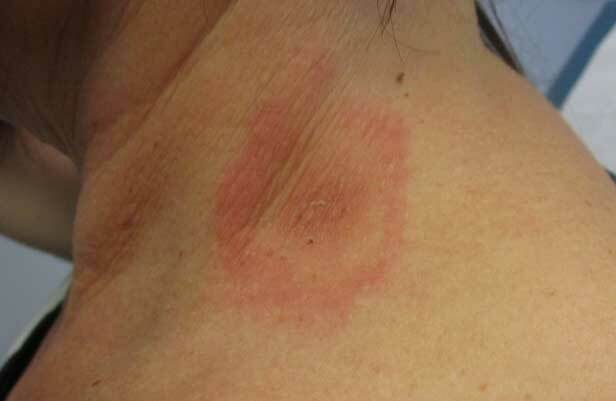 This red, round rash is a key physical finding. If left untreated, after months, the infection can spread to joints, the heart, and the nervous system. Lyme disease is diagnosed based on symptoms, physical findings (e.g., rash), the possibility of exposure to infected ticks, and if not clear, there are blood tests that can help in the diagnosis (though they are not always accurate). To prevent tick bites, avoid wooded and brushy areas with high grass. Walk in the center of trails. Use repellent that contains 20 percent or more DEET, picaridin, or IR3535 on exposed skin for protection that lasts several hours. Use products that contain permethrin on clothing. Treat clothing and gear, such as boots, pants, socks and tents with products containing 0.5% permethrin. It remains protective through several washings. Pre-treated clothing is available and may be protective longer. Shower as soon as you can after being outdoors in an area with tick activity and look over your body carefully. The most important thing to do when you find a tick on you is to remove it. You can remove the tick yourself with a tick removal device or with a set of tweezers. Grasp the tick as close as you can to your skin’s surface. Pull straight up and away from the skin, applying steady pressure. Try not to bend or twist the tick. Check the bite site to see if you left any of the tick’s head or mouth parts in the bite. If so, remove those. Clean the bite site with soap and water. Once you have removed the tick, place it in a sealed bag. See an Urgent Care physician or your primary physician as soon as possible to find out if any treatment is necessary based on the type of tick that bit you. Different parts of the country have different risks when it comes to diseases from tick bites. It is important to see your doctor soon after a tick bite so you can talk about your risks for Lyme or other tick causing diseases, what complications to look for and when to follow up. Because Lyme disease is common in areas with infected deer ticks you are strongly recommended to seek medical evaluation and treatment for tick bites. Antibiotics can cure Lyme disease if you go to your physician early. After waiting until more systemic symptoms occur it is harder to cure the condition and chronic symptoms may occur. See our Physicians and P.A.s at Doctors Urgent Care for the highest quality medical evaluation and treatment. We are familiar with and treat tick bites and early Lyme disease. Antibiotics required to treat Lyme disease will be provided for free in the office to start your treatment quickly and save you from waiting at the pharmacy.